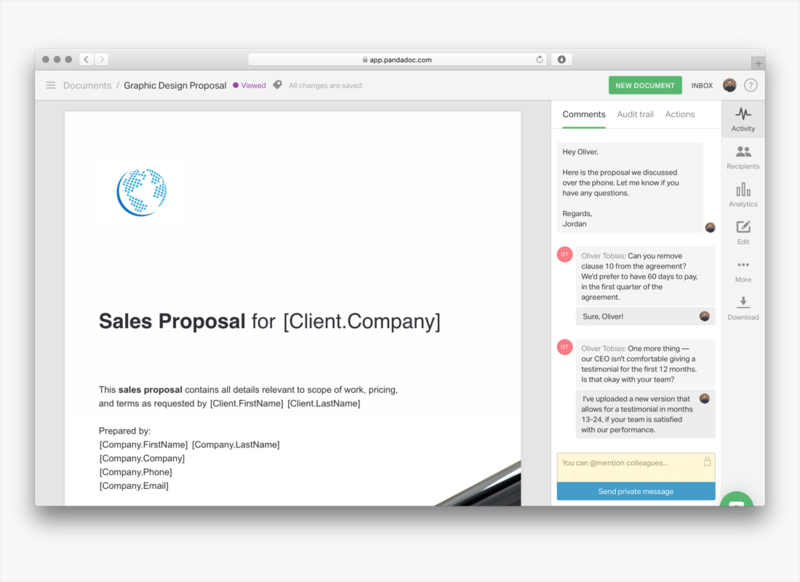 An easy digital way to create branded proposals and close deals with higher efficiency. Proposal management tools are designed to help sales teams and companies increase sales efficiency and automate the proposal and contract process. Who uses PandaDoc proposal management software? To be competitive and keep up with top-notch sales technology, sales reps need to use advanced tools. PandaDoc offers an integrated solution with leading CRM systems like Salesforce, HubSpot CRM, Pipedrive and others to help sales reps easily generate new business relationships. Create your own personalized proposals and collaborate with your internal teams and clients right within the PandaDoc proposal management tool. No need to leave your favorite CRM. PandaDoc conveniently allows you to stay focused on creating highly effective documents and exceed sales targets. Generate branded content and get the most out of ready-made templates. Create unique offers with embedded video or images. Work hand-in-hand with every team within your org, establish brand consistency, and organize content to help the sales team find it faster to make closing deals more efficient. Why PandaDoc proposal management software? The PandaDoc proposal management tool provides advanced analytics that detail when your recipient viewed each document and how much time was spent on each page. PandaDoc also specifies the status of every document as it moves through every stage of the document lifecycle. Did marketing create an exceptional piece of content? Or have you found a specific image that you feel would be the perfect fit to include in your doc? Within your PandaDoc workspace, you can create a custom content and image library to store your collateral and reuse them in every proposal and contract you send. PandaDoc offers extraordinary integration possibilities. Lead your business management processes to increased close rates. Integrate PandaDoc with efficient CRMs like Salesforce, HubSpot or Pipedrive, and you can instantly generate proposals right from your opportunities. PandaDoc Payments integrates with Stripe to allow you to collect credit card and ACH payments from recipients as soon as they sign your document. PandaDoc allows sales teams to quickly and more efficiently close deals without sacrificing quality. With the tool, you’ll spend less time creating quotes and proposals and increase value per deal and accuracy. PandaDoc is always online and running 24/7 giving you access to your management processes from any place, any time. Our proposal management software offers integrations with a plethora of top-notch solutions from a variety of industries. To help you ease all the processes of RFPs or bids creation, we offer integration with top CRM applications and payment systems. With the features our tool offers, your sales team will love the power PandaDoc has to offer. With advanced analytics, the content library, CPQ functionality, CRMs and payment integrations, and eSignatures, you will create error-free proposals to boost your sales. Our number 1 priority is the security of your proposals. When you work within our tool, rest assured that all your information is held to leading security standards. PandaDoc follows exact security measures approved for top secret government data.